My sister is going to have a little baby girl! I’m tremendously excited. I have to constantly exert all sorts of self-control lest I buy every “my auntie is awesome!” onesie that I happen to come across. Anyway. Her friends did most of the hard work involved in throwing her a baby shower; all I did was to volunteer to contribute baked goods. The theme: butterflies. 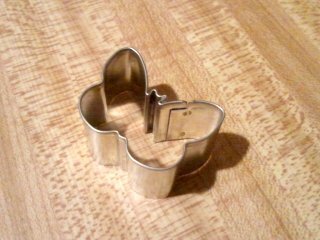 I bought myself a tiny butterfly cookie cutter, about 1″ by 2″. 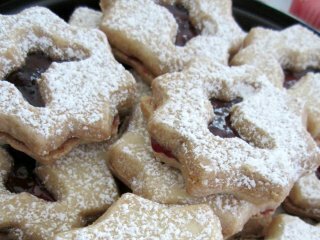 I decided to make Linzer cookies with butterfly cutouts. 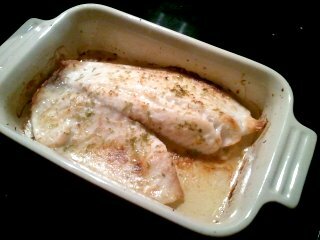 I used this recipe by Ina Garten, who has never led me astray. They worked well, for the most part, except the whole process was rather time consuming. Because it was so warm in the kitchen, the dough kept getting too soft to cut properly. I had to chill the dough in the fridge, take out a section, quickly roll it and make cuts, and stick the cut cookies and the remaining dough back in the fridge again. Repeat as necessary. The cookies turned out well though. That’s cherry preserves in the middle. Instead of rolling the cutout butterflies back into the dough, I baked them as well, with just a sprinkling of coarse sugar. Then I used them as toppers on Rolo pretzels. I hadn’t made Rolo pretzels before, but a coworker swears by them for easy entertaining. Basically, you put a Rolo candy on a pretzel, bake it until the Rolo is softened but not melting (about 3 min inside a 350 degree oven), and then smush a nut or something on top and let the whole thing cool to solidify. Since the kitchen was warm, these also went into the fridge to cool and set up after assembly. I’m glad the fridge was fairly empty that day. These also took some time to assemble, mostly because I had to unwrap each Rolo candy individually. 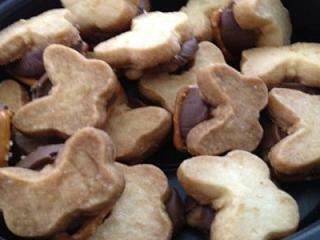 The shortbread butterflies worked beautifully with the caramel Rolos and the salty pretzels. Looked cute, too. 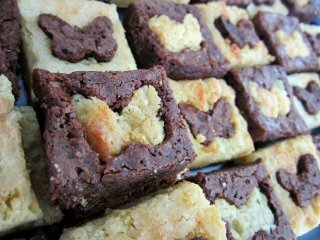 Finally, because I still wasn’t done with the butterfly cookie cutter, I decided to make a butterfly version of Deb Perelman’s white and dark brownies. Essentially, she bakes up two batches of brownies (white and dark chocolate), and then proceeds to cut heart-shaped centers out of each piece and swaps them so that the colors contrast and the brownies are uber-cute. Check out her photos; they’re beautiful. For some reason my white chocolate brownie batch came out thinner than the dark batch, but I was still able to painstakingly cut butterfly centers and swap them. (After chilling the cooked brownies. Everything needed to be chilled!) Also, thank goodness brownie material is sticky; whenever I cracked the corner of a brownie, I was able to unobtrusively press the cut together with my fingers. The end result turned out quite nicely. The shower went well, and I’m proud of my baked goods, but I think I’m ready to take a break from the butterfly cookie cutter. The hot weather has really been putting a crimp in my cooking. Who wants to stand in front of a stove in this weather? I hope we get a break soon… I’m very grateful to the hard workers at the farm for toiling in the heat. 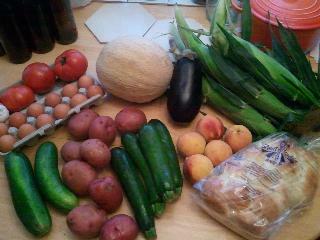 Week 8 of the CSA was a “bonus item” week so we got cheese instead of eggs; I chose a Colby jack. 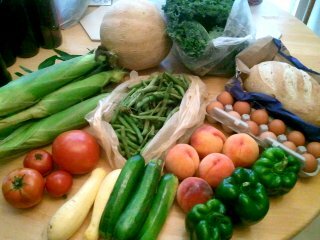 The rest of the pickup: kale, cantaloupe, corn, tomatoes (they look pale but they flushed up pretty quickly), peaches, bok choy, eggplant, green peppers, and bread (Great Harvest parmesan sourdough). We managed to eat almost everything here, but I failed with the kale. Kale usually holds up pretty well in the fridge, but I waited too long and it was sadly slimy and brown by the time I pulled it out of the bag… two weeks later. 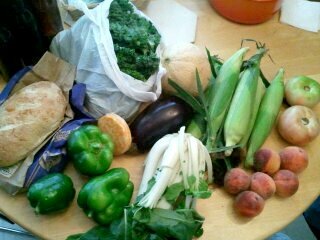 It’s always sad to throw good CSA vegetables away. 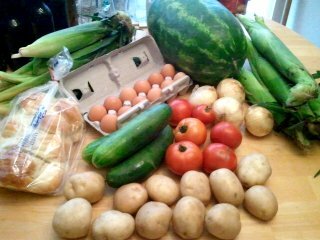 Week 9 of the CSA: garlic, tomatoes, cantaloupe, eggplant, corn, peaches, zucchini, red potatoes, cucumbers, eggs, and bread (Great Harvest challah). I’m always glad to see cantaloupe and peaches. No cooking required!